Stadium Bukit Jalil. I have not entered this stadium since it was built for Commonwealth Game in 1998. At most, drive through it, but never went inside. Yesterday, i had the privilege to not only enter the Stadium, but ran on the expensive rubber turf as well! Myself, wifey and Phui Tin carpooled to Bukit Jalil and we reached there about 5am. Parking was easy at that hour as most people would had tried to park further away for easier exit. Myself not being familiar with the place just parked at the next place available. After all, we are there to run, so parking a bit away is not a big issue. But we found out we were parked right where it is nearest upon exiting! How is that for blessing?Oh ya, parking was free in Carpark C! With 30minutes to gun off, the crowd started to swell and we bumped into many familiar faces. It is always nice to see running friends out on a Sunday morning for a run! Reen. She got Norman, my childhood buddy to run! Power of love! The race gun off at 5:37, which was 7minutes off schedule. It took us 3minutes to clear the start line. The amount of people running 21km was massive. In fact, up till KM18, i was still running with the same group of people that was moving at the same pace as i am! The organisation by the Bukit Jalil Running Club was fantastic. If there is one improvement to be made, it would be the litter bins at the water station. There were simply not enough of plastic bag around and cups were thrown everywhere on the road. Malaysian runners, though slightly more matured, has not embraced the spirit of cleanliness. Maybe the organiser should try emulating Hong Kong Ultra 100km by giving a disposable/foldable cup to each participant - no cup, no drink! Apart from that, the route was good. There were actually more downhills than uphills. The climb were short and adequate enough to work the heart. The downhill allow for a long active recovery. It was a very comfortable to be holding a 6:00 pace for most of the way. Wifey was leading me most of the time. We even managed a cool 3:20 pace for about 1km on one stretch! 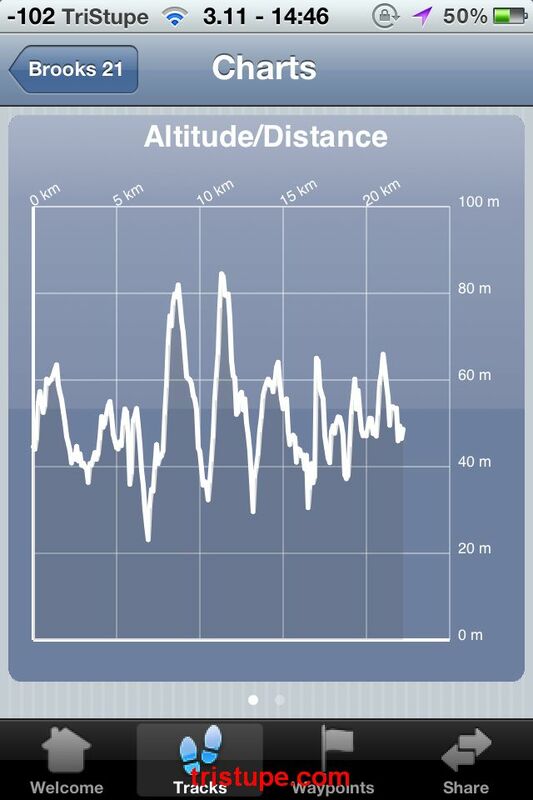 Run profile. The ascent was 705m and descent was 698m. The given race vest was very see through and it doesn't absorb sweat at all. It will wick the sweat off almost immediately and this will cause the sweat to drip down on the shorts, run down the legs and subsequently, wet the shoes. While that is really not a complain, i must learn to wear full length socks and not the 3/4 type as there are too little material to absorb the sweat. Looked like i will be maintining this haircut for some time. Note the running vest. So shiny! Thank you Doc Pui San for the pic! The running route passes along mainroad, next to highway and even in housing area. The race started with the runner looping around Bukit Jalil Sports Complexes and passing through Astro and KL-Seremban highway. Apart from drivers that was just too impatient at the Astro-KLSeremban slip road, traffic control was good. However, there is a lot of room for improvement (such as placing marshals at correct places rather than they grouping together at one spot). We then ran along or under the MEX highway, passing by IMU before turning into Taman Gembira (Happy Garden) and at the fringe of OUG and United Garden. That part of the run was almost downhill all the way and provided a lot of recovery opportunity. The route then brought us running parallel to the MEX highway and that was at KM17 that i lost wifey. I had some issue (no excuse given, as pain is temporary) and had to keep adjusting myself to lessen the discomfort of the Sciatica that made a sudden visit after so long. Carrying on the final 5km was pretty much a "ignore the pain" kinda thing. The route then loop back to the same IMU route and towards the Bukit Jalil Golf&Country Club, runings pass those condominiums built (and now owned) for Commonwealth games. Weather was great and there was no complain. Along the way, i bumped into an amputee doing the 10km run. Immediately it reminded me of Bro Shariff from Singapore otherwise known as Singapore Blade Runner (SBR). This young man certainly showed those with two legs how to do it! Well done bro! I wish you well! Eventually, the final 1km brought the runner back to the Bukit Jalil Stadium via entrance C.
I finished my race in 2:40(gun time) and i supposed my net time would be about 2:36. It wasn't the best timing, but under the circumstances that made me lost my momentum, i was pretty happy. More so when wifey scored another personal best for 21km. She came in at estimated 2:29(gun time) which might produce 2:25 net time. The total distance was actually more than 21km. I recorded 22.19km on my GPS and 22.4km on my Polar. So, wifey's actual PB is much lower! Well done! Yay! Finished! Can you see how see through the running vest were? You can see the sithloutte of my manboobs and tummy...Thanks Pat Ee for the pic! As we crossed the finish line, i noticed that runners were all jamming up at the counter that give up the finisher goody bag. It was pretty messy with (what i noticed) some runners taking more than their fair share. I guess the people manning the counter sort of give up when Malaysians forgot their manners again. I was made to understand that there were sufficient finisher goody bags for all! Suggestion would be for the bags/medal to be given once the runner cross the finishing line. That way, only real finisher gets them! Make the runner work for it! The goody bag has the finisher medal, bottle of Cool Rhino water and a shoe bag from BJRC. Got to be one of the most useful goody bag that was given in a long long time. best of all, no useless brochures! Thank you BJRC, Brooks and all sponsors! Pros - Great route. Good organisation. Water station sufficient. Commendable traffic control. Great venue. Cons - Insufficient litter bins for water stations. Ugly Malaysian drivers and runners. Chaotic finish goodies bag collection. Better - Tau Foo Far at finish. OMG! It was super smooth and i had mine without sugar but with red bean dessert added in! Superb! Personal Statistic - HRMax at 94% with HRave at 85%. Average pace was 7:15. Fastest pace was 3:20. The route was over distanced by about 1km to 1.2km. 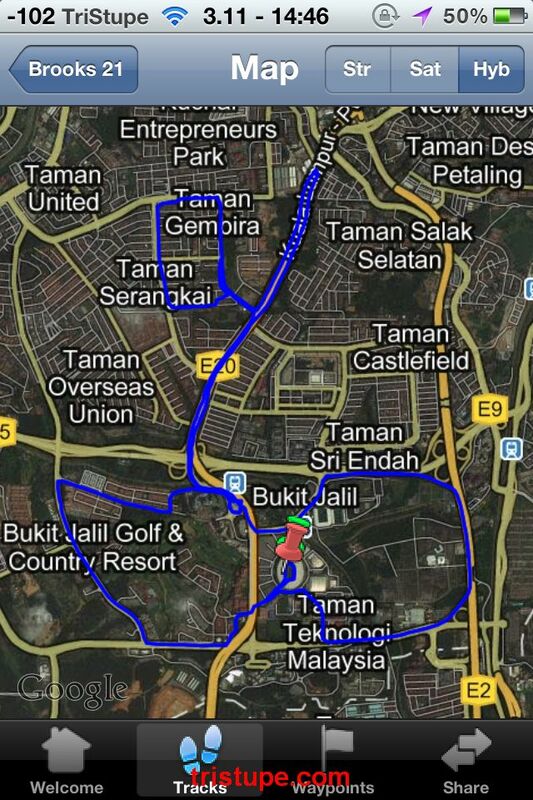 My GPS traced 22.19km in total. GOOD for personal mileage! Total kcal burnt to be estimated 1640kcal. Do You Know That - The Malaysia Airline (MAS) CEO, AJ Yahya ran with you. He clocked an unofficial 2:17 over the 22km distance. Well done Boss Man! Yummeh! Estimated to be 450kcal! Sorry...can't help it! thought the run was quite good, despite me running for only 10km. Will try half next year! TTDrinker - thanks for dropping by! We run because it is pak tor! Well, at least until Km17...hahaha!